This quick, warm salad of nutty spelt grain and clean river trout always lifts my mood, particularly on a wet, wintry day. With a light air of spring about it, it provides a welcome break from the richer dishes I often prepare over the colder months of the year. It’s an excellent way to use up leftover trout, or any fish for that matter. It would work beautifully with sea bass or bream, too. Be generous with the herbs, lemon and olive oil, which elevate the salad and turn it into something quite magical. Split the half cucumber in half along its length. Scoop out the seeds with the tip of a teaspoon, then slice the cucumber into 1cm (1⁄2in) half moons and place in a bowl. Add the onion, vinegar and sugar, and plenty of salt and pepper. Use a spoon to tumble the cucumber through all these ingredients and set aside to marinate. Place the pearled spelt in a sieve and rinse well. Transfer to a pan and cover with cold water. Place the pan over a high heat and bring the liquid up to a simmer. Add the mint stems to the spelt pan so that they flavour the grain as it cooks, and cook for 15–20 minutes, until the spelt is tender but retains some bite. Drain the spelt in a colander and allow it to stand for 10–15 minutes. 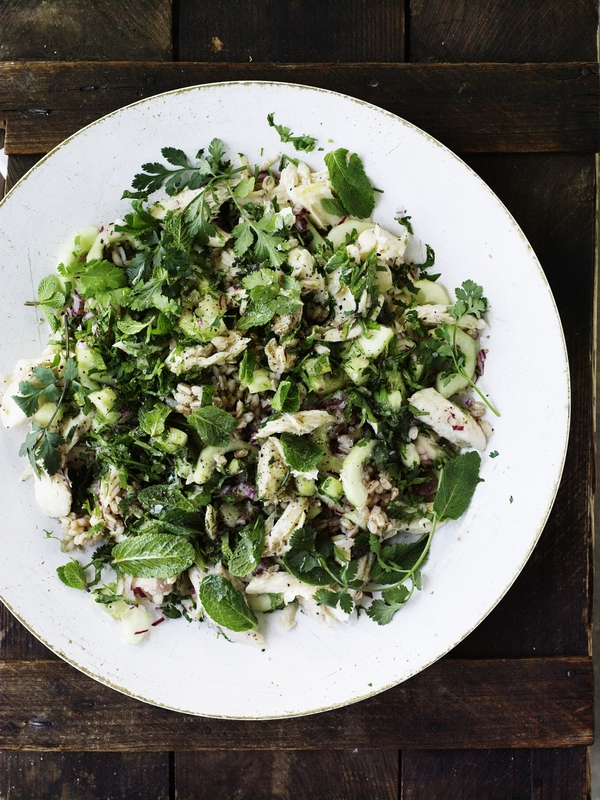 In a large bowl combine the spelt with the cucumber slices and all the vinegary, sugary cucumber dressing. Add the olive oil, season well with salt and pepper, and stir to combine. few tender sprigs of the coriander. Add the chopped herbs to the salad, then spoon the salad onto a serving platter or into a bowl and drizzle over the lemon juice. Scatter over the whole herbs, then bring to the table straight away.